Sharing a meal and cooking for loved ones should never be stressful—and doesn’t have to be difficult. 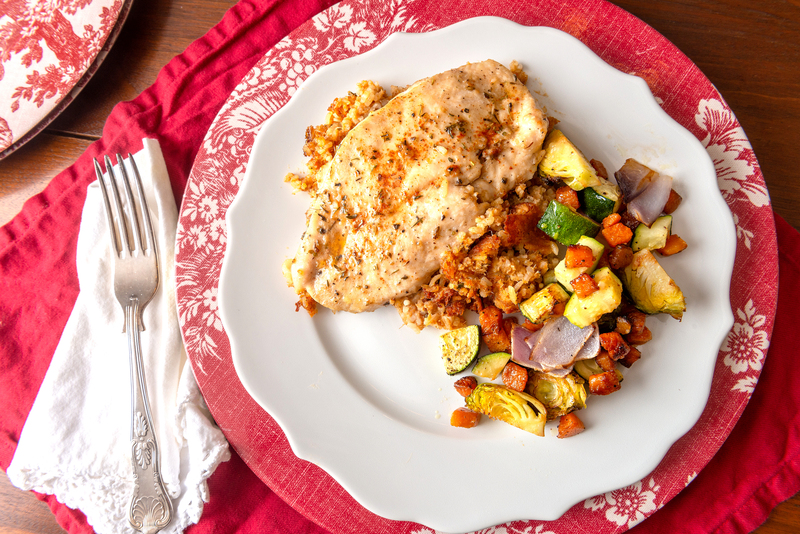 This easy yet delicious Valentine’s Day dinner is a simple mid-week meal that takes little time to throw together and will give you the opportunity to sit down and enjoy the people dearest to you. This dish takes just 10 minutes to throw together because it uses store-bought boudin and just a few other fresh ingredients. It can be prepared ahead of time and then popped into the oven for about 45 minutes when it is time to bake. We like to use a smoked boudin for extra flavor, but feel free to substitute your personal favorite. 1. Heat the oven to 350 degrees and lightly spray a 9-by-13-inch baking dish with cooking spray. Rinse the chicken, trim off any excess fat and pat dry. 2. Remove the boudin from the casing. Crumble it in an even layer at the bottom of the dish. 3. In a small sauce pot, melt the butter and stir in the garlic, being careful not to burn it. Add the Worcestershire, salt, pepper and herbs. Stir to combine. 4. Brush the chicken on one side with half the butter mixture. 5. Place the chicken in an even layer, buttered side down on top of the crumbled boudin. 6. Brush the tops of the chicken breast with the remaining butter mixture and cover the dish with foil. 7. If you are not baking right away, place in the fridge until you are ready to bake. Remove the dish from the fridge and allow it to come up to room temperature for 10 to 15 minutes before placing it into the hot oven. This will help you to avoid cracking the dish. 8. Bake covered for 30 minutes. 9. Remove the foil and continue baking another 12 to 15 minutes or until the chicken is cooked through but still juicy. Serve hot. We love roasting all kinds of vegetables—we think it is really the best way to prepare them. It brings out the natural sugars and gives them a nutty flavor. Butternut squash and zucchini along with red onion and Brussels sprouts has become one of our favorite combinations. The slight sweetness from the butternut squash helps to balance out the Brussels sprouts. The red onion starts to caramelize, giving these veggies just the right mix of flavors. 1. Heat the oven to 375 degrees. Line a baking sheet with foil. 2. Place all the sliced vegetables in a large bowl. 3. Toss them with the olive oil, salt and pepper until well combined. 4. Place the veggies in an even layer on the prepared baking sheet. Roast on the middle rack of the oven for 10 minutes. 5. Gently stir the vegetables to prevent them from sticking. Continue roasting for another 5 to 7 minutes. Serve immediately. There are a few varieties of Belgian-style toaster waffles on the market today that are quite tasty. So we decided to use them as the base for this quick and easy show-stopping dessert. 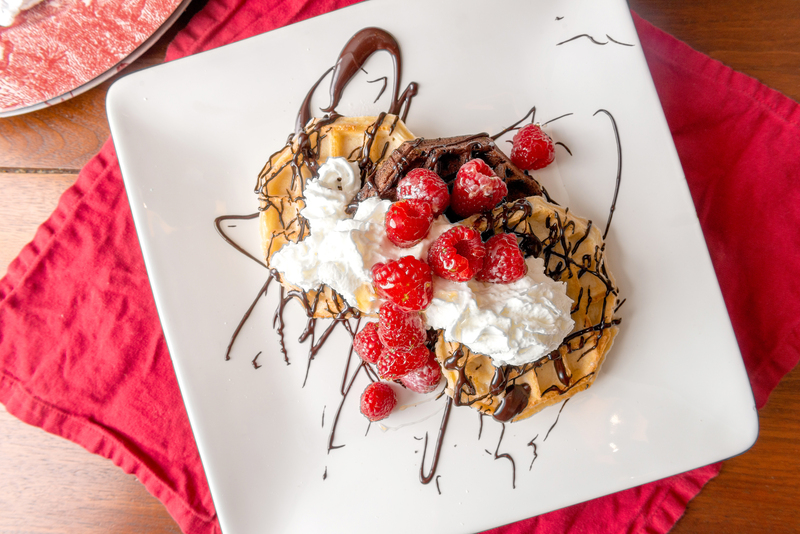 We topped the waffles with an easy homemade chocolate ganache, along with fresh whipped cream and berries. Your family and friends will be much impressed. 1. In a microwave-safe dish combine the chocolate chips, milk and vanilla. 2. Heat on high for 30 seconds. Remove from the microwave and stir. 3. Place the ganache back in the microwave and heat for another 20 to 25 seconds. Remove and stir until the ganache is smooth. 1. Pour the whipping cream into a mixing bowl. 2. Using an electric mixer, begin whipping the cream on high until soft peaks begin to form. 3. Add the sugar and vanilla. Continue whipping until the cream is just set. Chill until ready to use. 1. Toast the waffles according to the instructions on the box. 2. In a small bowl, toss the raspberries with the honey. 3. Place the toasted waffles on a plate. Drizzle them with the chocolate ganache. Top with the fresh, chilled whipped cream and raspberries. Serve immediately.